If you see our profile page, you'll notice something unusual. Bicycle resurrection. What gives? Why don't we say "restoration" instead? You see, not many of us are blessed with family or relatives who would like to inherit us their prized vintage bikes. 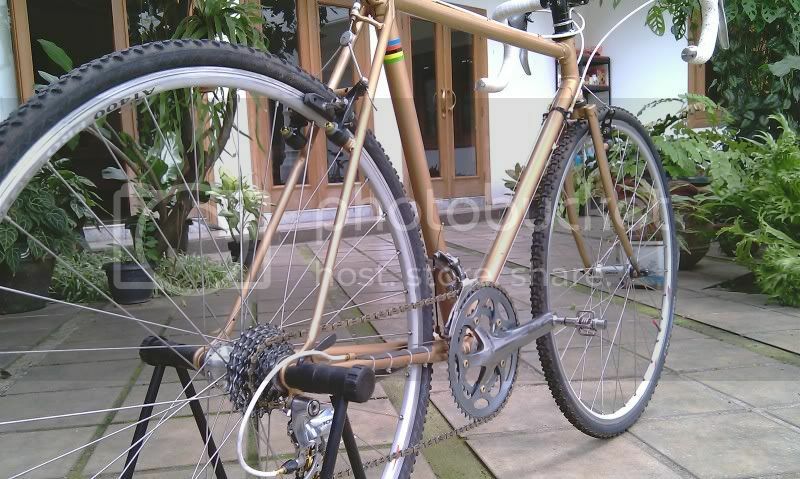 Or maybe you have one particular bicycle with high sentimental value (graduation gift, first salary, etc. ), but the parts has shown their age. Or just be honest, your old steed is just not worthy enough to be classified as "vintage" or "classic", or you just don't want to spend time and money to hunt for so-called period-correct vintage parts. I can go on and on with this. Back to the topic. For me, bicycles have souls (you can expect something like this came out from a self-confessed bike geek). And the soul resides in the frame. It dictates everything, from how do you ride it to what would you expect from the ride. The ride characteristic. The ergonomics. The handling. How much comfortable will you be. Want proof? Let's say, you have this bicycle, back from five years ago. You ride it everyday. The more you ride the bike, the more you'll be accustomed to it. Not just the geometry or the ergonomics, but everything. The weight, how your bike will respond to your actions, what would you expect if you lean it a bit to the left, everything. You and the bike becomes one. It becomes the extension of your body. Then one day, you decided to replace the frame. Maybe it's intentionally because you wanted something lighter or snappier, or because you have no other choice than to replace it because it's broken beyond repairs. Whatever it is, once you replaced the frame, the bike will never be the same again. You replace the frame, then you'll replace the soul. So. Now you understand my opinion about a bicycle and its souls. But look, there's this thing called advancement of technology! Innovations on bicycle parts are always ahead of bicycle frames, except for full-suspension mountain bikes. The drivetrain rolls smoother, the shifting seems more seamless, parts weights drops easier than exchange rates, and so on. You wanted to get your hands on these, but you just don't want to part with the old amigo in your bikestand. You're attached to the bike, and so it does to you. Luckily, as any other things in modern industry, bicycles have standards. Standards on sizes, and how things are installed. And thankfully, no matter how advanced parts will have become, these standards will remains the same. Well, at least on road bikes and hardtail mountain bikes. That means, your old steed is capable to be injected with the latest technology we were talking about! So you will get hands on to those fancy new 2x11-speed drivetrain with integrated brake and shift levers, without losing the same comfortable position and that snappy riding characteristic you have developed for years with your trusty old steed. So, resurrection? Yes. Resurrection. Because it's like injecting new power to an old friendly superhero.